'Everything involving the "Tank Gang" who befriend Nemo is pure gold, littered with sharply realised cinematic homages, and offering Gill (a flawless Willem Dafoe) as one of Pixar's all-time great characters'. As with any Pixar release, it feels more worthwhile to assess Finding Nemo against the studio's own back catalogue than against animated cinema in general. In the thirteen years since its release in 2003, Pixar's fifth feature has become as beloved by many as Toy Story, Monsters Inc. and other jewels in Pixar's crown. Even so, there are undoubtedly a handful of reasons why Finding Nemo remains excellent, but not perfect. The first is the plot, which is never quite as strong as that seen in any of Pixar's very best releases. Even A Bug's Life, the studio's sophomore effort largely relegated to being viewed as one of their lesser films, manages to utilise its Seven Samurai-inspired narrative to the full throughout in a way that Finding Nemo can't manage. After a remarkably rapid set-up which takes in everything from tragedy to family drama to fast-paced action all in the first twenty minutes, the film then settles into a largely episodic structure in a way that Pixar's output prior to this had largely avoided. Whilst consistently enjoyable, the simplistic delivery of the story does mean that Andrew Stanton's lead directorial debut lacks something of the narrative depth achieved in earlier films from the studio. The other key issue is in the central pairing of Marlin (Albert Brooks) and Dory (Ellen DeGeneres), who also suffer in comparison to earlier Pixar duos. The dynamic between the two is never effortless in the same way as Woody and Buzz or Mike and Sulley. Marlin in particular as protagonist is quite hard work thanks to his acutely tragic arc making his outlook throughout the film relentlessly pessimistic, at times exhaustingly so. Dory meanwhile comes dangerously close at times to becoming a one-joke character, saved by a few key scenes of genuine emotion which emerge as some of the film's very best. Having mentioned Marlin's negativity, it's perhaps ironic that this review has focused almost entirely on Finding Nemo's faults when there are so many aspects of the film to praise. The animation is sumptuous, resolutely standing up to scrutiny over a decade after release. The humour too is pitched and executed exceptionally well. In particular, everything involving the "Tank Gang" who befriend Nemo (Alexander Gould) is pure gold, littered with sharply realised cinematic homages, and offering Gill (a flawless Willem Dafoe) as one of Pixar's all-time great characters. Such successes shouldn't go without saying when most other film studios, both animation and live action, struggle to achieve them as consistently as Pixar do. 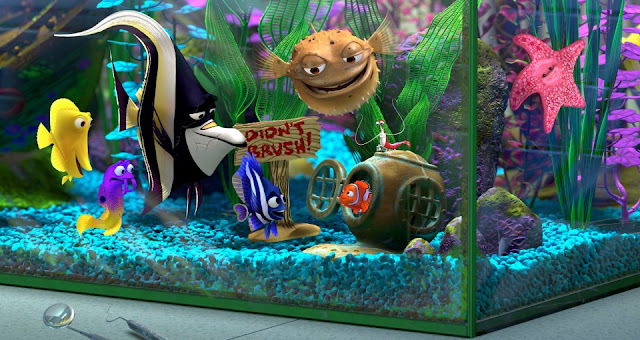 But with the aesthetic and comedic brilliance we've come to expect from the studio evident throughout much of Finding Nemo, it's ultimately the relative shortcomings which prevent the film from joining the absolute cream of Pixar's crop.